Last week, the DOL announced that employers will not be penalized if they do not send the exchange notice to their employees by October 1. A survey by the Washington-based ERISA Industry Committee indicated 94% of employers plan to send the notice anyway. I just sent the notice to ASHA staff via email and checked it off my to do list. Some asked why I didn't just post it to our intranet which is how we usually share information, but that didn't meet the requirements Under the Patient Protection and Affordable Care Act. This is the note I sent along with the notice. You’ve probably heard about the health care exchanges that are expected to be up and running the first of next year. In preparation for that, employers are required to share the attached marketplace notice with their employees. The notice is intended to explain your right to buy coverage through the newly established health insurance marketplace (what you’re hearing referred to as the exchanges.) 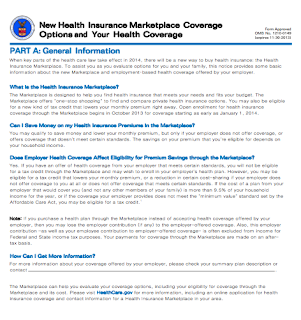 The opportunity to enroll in the marketplace will begin October 1, 2013, with coverage effective January 1, 2014. 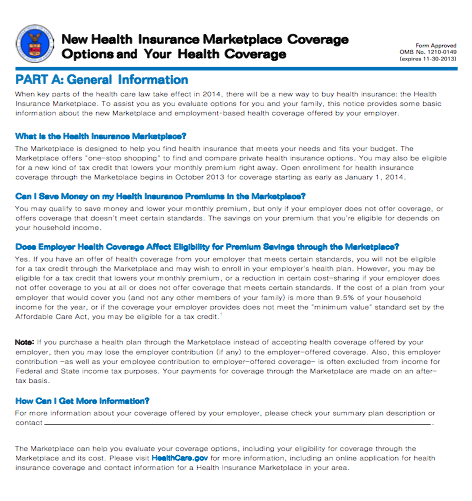 Everyone must have health insurance coverage on January 1, 2014 or pay the penalties. Because ASHA provides coverage for us, staff are unlikely to qualify for any of the subsidies available to people who seek coverage through the exchanges. If staff did seek coverage through the exchange in lieu of the coverage ASHA provides, the individuals would lose the contribution ASHA makes toward our coverage. The small portion of the premium staff do contribute now is paid pretax. Premiums paid through the exchanges will be paid after taxes. I realize some of us have friends and family members that may be interested in seeking coverage through the exchanges. The second document I’m attaching is a pamphlet presented in Q&A form. I think it does a nice job of explaining the obligation to have coverage, what the penalties are if you don’t have coverage, and what your options are for obtaining coverage. I hope you find this information helpful. You can learn more by going to www.healthcare.gov.